This Fall I've been on the road a lot. That's why I'm happy to say that we have a couple local events going on this week! If you're in down in the Los Angeles area, we have a great opportunity there as well. Eucon- Eugene Comic Con, in Eugene OR from Nov. 11-13th is a great chance to pick up any markers you need for your projects. We are hosting the Imagination Room, a room with over 5,000 sq. ft. of inspiration. Guest artists from around the country, ongoing live workshops, coloring tables to try our products, and demo artists to ask about techniques. You won't want to miss it! Due to our amazing range of artists, I'm only teaching one class, Friday afternoon. Here's a barbarian woman I drew last year while at Eucon. It's a lot of fun to draw whatever random things come to my mind, and this was definitely random. Who knows what I'll think of tomorrow at the con? Tools of the Trade, Nov. 16-17th in Eugene OR at the U of O Bookstore, on campus. 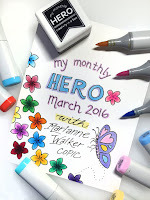 This is another great opportunity to add to your marker collection, as they have an awesome sale price. The event is totally free, and there are many artists and dealers there to share their neat new art supplies. Come see me color another side of my art. 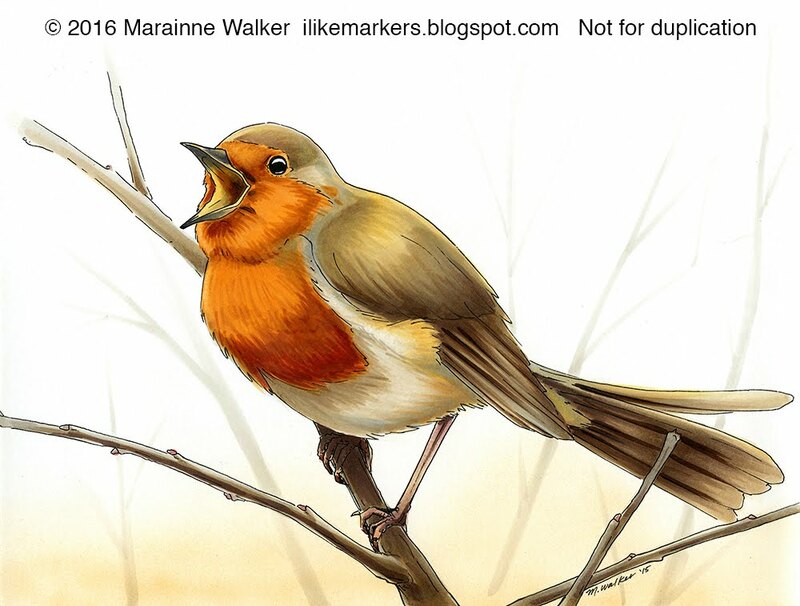 Last year I was able to draw and color some beautiful birds for my portfolio. Here's one I made at that event. Nov. 18-20th CTN Expo. This is an amazing animation conference full of the most talented animators and illustrators in the industry. I won't be showing my work, I'll be busy managing the booth, but this is a great chance for you to see how pros use Copic markers. For more info on this event, click here. As the year winds down, I hope to see you at one of these events. Happy Fall! 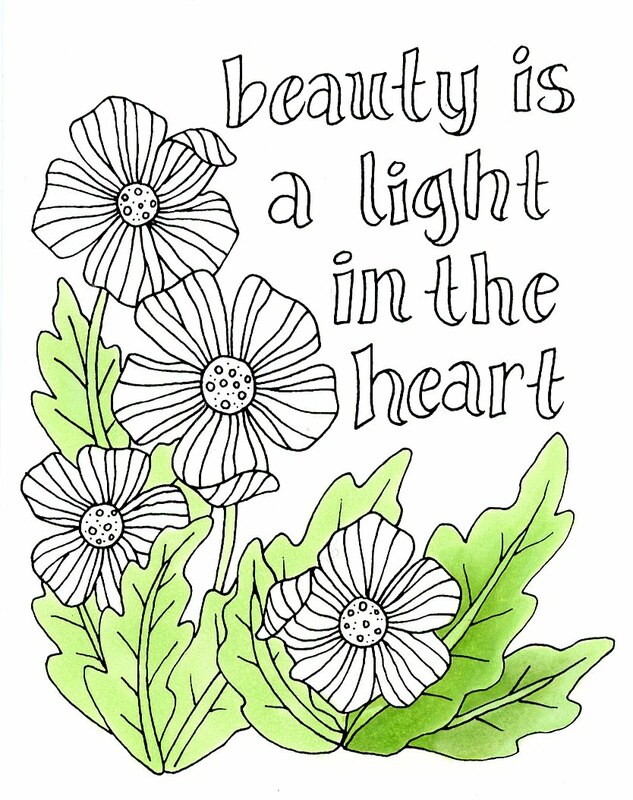 For those of you who like coloring, but want to color your own picture, you're in luck! 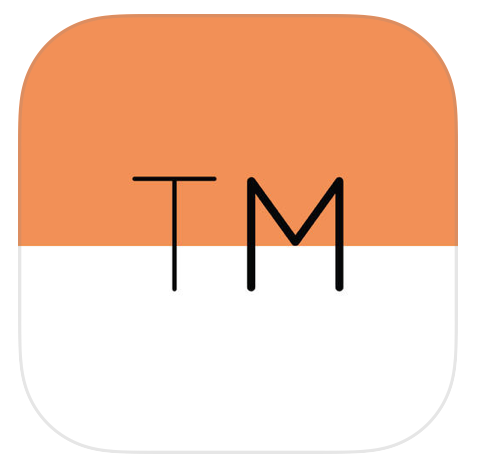 We just released the first version of our new Tracing Memories App on the iTunes store (for iPhones and iPads). Meanwhile, check it out and let your friends know. It's free, and super-easy to use. 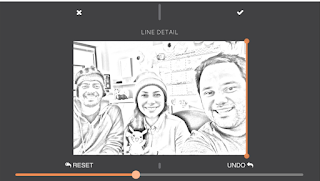 You just take a photo on your device, click a few buttons, and presto, you have an outline! 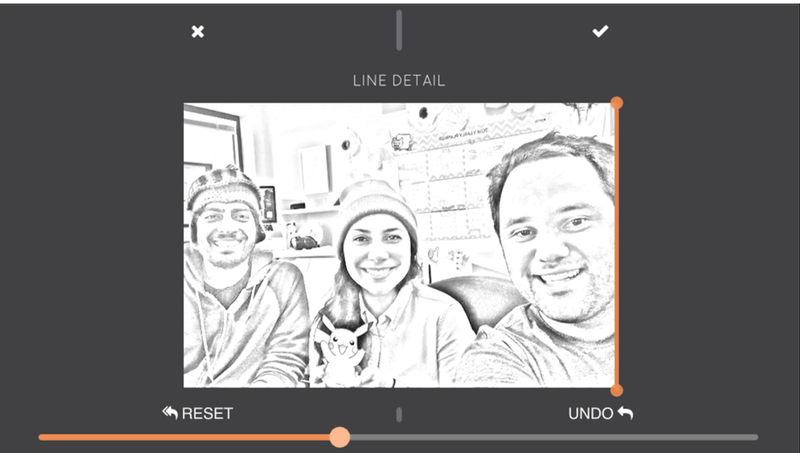 The app allows you to control line thickness and level of detail, with just a swipe of your fingers. The super easy interface helps you make the look you want, then you can easily send to a friend, or print it yourself. I'm heading off this weekend to teach at the Oregon Art Education conference, and we'll be using this app to make images in my workshop. 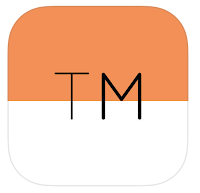 If you download it, please let us know what you think. Our developers have been working hard on the functionality and programming to help you have a seamless experience. 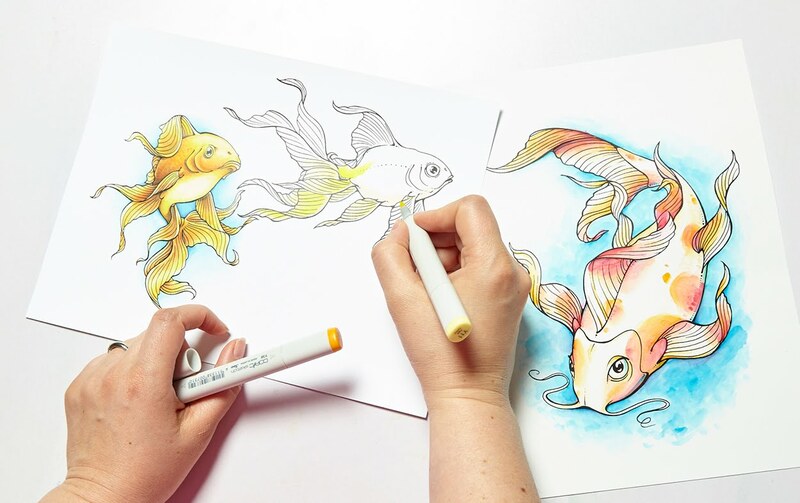 We want you to be able to get to coloring faster. A few days ago I showed you how I re-drew an old piece from my portfolio and colored it from scratch. 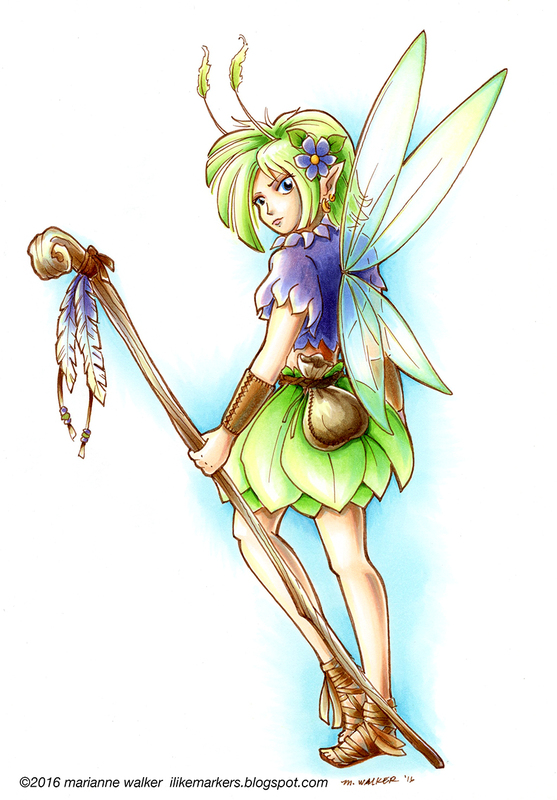 This time I want to show you a piece I drew and colored back in 2005, then decided to update the colors. Here is an old, kinda washed out photo of the original. The colors were pretty soft, the trees were washed out, and the whole thing was a bit flat (the photo also makes it look worse, but it was pretty bad). I had been experimenting with the markers at the time, learning how to use them better, so this was not a fabulous coloring sample, but I did like the drawing itself. I realized when I was flipping through my portfolio that I had actually never finished coloring the image, but it looked "good enough" so I'd ignored it all these years. Well, I pulled it out. 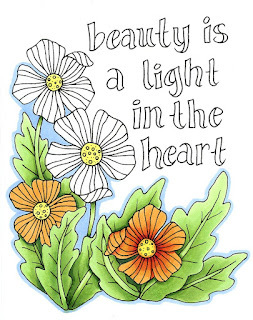 This was a line drawing that I had photocopied onto color laser copier paper. I had colored it and stuck it away. Now, 11 years later, I pulled it out to tighten up a lot of things. One of the most amazing traits of Copic markers is that on uncoated paper you have an infinite working time. 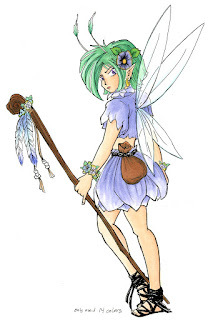 Meaning, just because I colored something 11 years ago doesn't mean that it's done. I can pull it out and re-work the colors at any time. Once the ink is wetted with another marker again, I can mix and blend. So, I throughly worked over this piece. Biggest priority was fixing the lack of contrast in the trees. Years ago I had dabbed on hand-sanitizer to affect the texture in the trees. Trouble is, hand sanitizer really fades out colors. It looks cool, but I learned through trial and error over the years since 2005 that I should have started darker on the base color first. I also crated more depth on the bushes and shrubs. Now you can clearly see which trees are in front, which bushes are in the foreground, and how dimensional the fern-things are. Next, I made him look less flat. Again, deepening the shadows on my character makes him pop and look much more dynamic. (by the way, Tad is his name, as in "A Tad Bit of an Adventure", the comic series I was working up at the time). 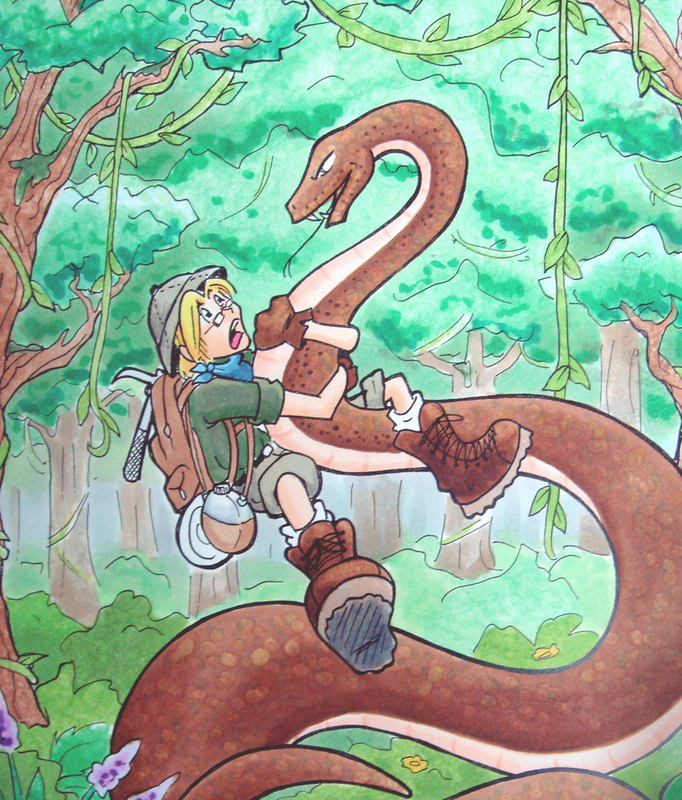 I added better skin tones, shadows on the snake, and generally punched up the contrast on the character. 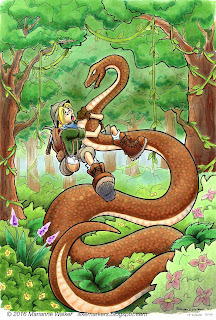 Last, I spent a lot of time on the snake. In the first sample, you can see I had a few, irregular scales dotted in with a variety of colors. This time, I increased the contrast in the shadows and more clearly defined the scales on the belly with the colorless blender. Once all the contrast was done, then I went, scale-by-scale with the colorless blender and added more regularity to the scales. To create dots, I simply touch the tip of the colorless blender to a colored area and it pushes the color out the backside of the paper. To show you what I mean, here is a scan of the backside of this picture. 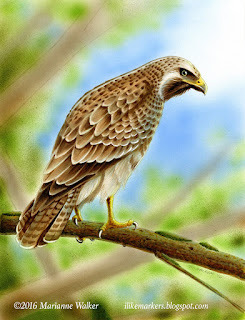 Because this is on such thin paper, you can clearly see the contrast and effects of the blender on a colored area. 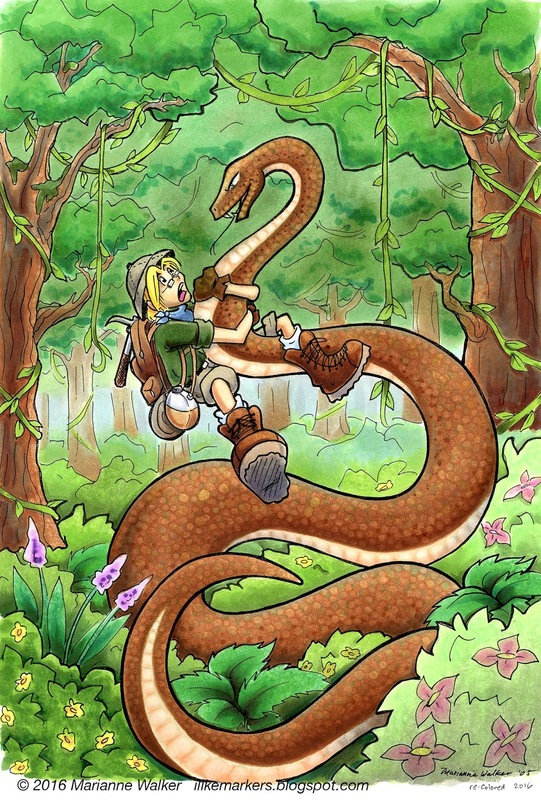 What is really amazing is that except for the shadows, the brown ink on the snake is the same ink I put down 11 years ago. So, all the ink pushed out the back of the paper came from a marker more than a decade ago, and I was still able to move it around. Love that about my Copic Markers! Have a great week, and I hope to see you at some upcoming event! Note if you want to take all 3 workshops in a location, we offer a package discount HERE. Use a limited color palette to make amazing mini masterpieces. No experience necessary! $99, 2 to 6pm. We have booths at many events this Fall. If you are nearby any of these upcoming locations then stop by and check us out! This year has been pretty busy. I know I haven't been around for a while, but never fear, I am still here. Recently I was at Salt Lake Comic Con and I was flipping through my old portfolio. It is sadly in need of updating as a lot of the artwork I'd made was about 10 years old. Some of the artwork I look at and cringe...I'm so much better at drawing than I was 10 years ago! (A big reason to keep a portfolio is to remind yourself how much you've improved over time). 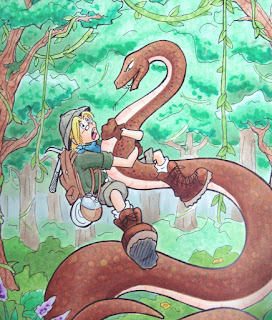 Other artwork I looked at and decided it just needed coloring touched up, since I colored many of the pictures during conventions, with limited supplies, or while I was talking to others. And, my coloring has improved a lot in the last 10 years. This first piece is one I originally drew about 12 years ago. Apparently when I was at a demo I only used 14 colors the first time. I've always liked this spunky fairy, so in flipping through my portfolio this weekend I figured now was the time to update her. First, I traced her outline onto a clean sheet of our sketchbook paper using a brown multiliner 0.3mm. I have also changed my style of drawing a bit over the years, so I cleaned up my line work a little. Sometimes, just redrawing something you made previously makes all the difference in changing something from good to great. I colored this version with way more than 14 colors! 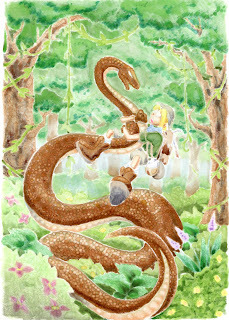 B00, BG000, YG11, Y000, E000, BV11 are the main colors used throughout, then I enhanced each area. The wings are colored with B00, BG000, YG11, Y000, and a glitter pen (you can't see it but it sparkles). I used the colorless blender to lighten up the transparent areas that show the shirt and arm through. The purple areas are colored with BV11, B66, and BV17, with highlights of B00 and Y000 (Heck, I used highlights of Y000 and B00 throughout all areas of the picture). Green things are colored with YG11, YG13, G02, YG17, Y000 and B00. I used a few different earth tone families. E40's for the sack and base coat on the staff. The skin is colored with E0000, E11, BV11, E13, E15, B00, Y000. The shoes and wrist cuffs are in the E30's family, with the B00 and Y000 thrown in for good measure. I'm excited! This came out so much cleaner, crisper, than the one I made 12 years ago. Now, at least one page in my portfolio is updated (only like 30 more images that bug me to go!). Doing this exercise really helped me see just how much I have improved in that time, so I strongly encourage you to also go through and re-color something you made a long time ago. Ok, I'll share another updated artwork soon! Summer is here and a lot is going on. I'll get through some announcements, then we'll move on to more fun stuff. 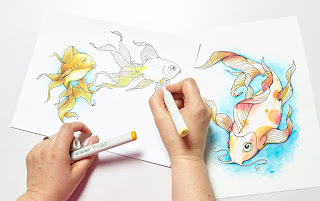 If you want to see the live video from the last post on coloring some beautiful goldfish and koi, you can find it Here. 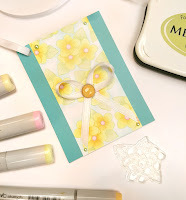 First, if you didn't know, there is a great blog-hop contest going on right now for the Copic Paper Crafting team. Start playing along on Debbie Olson's blog, then work your way through the questions and email the answers for your chance to win a free class from us in 2017. Hurry! You only have until tomorrow to register! July 1-4th, Anime Expo, Los Angeles, I'll be teaching coloring workshops along with a host of other talented artists, so come see us! 9th - Main Street Stamping, Tigard, OR This class is perfect for adults getting into basic coloring with Copic products. Contact the store for registration details and to find out about future classes. 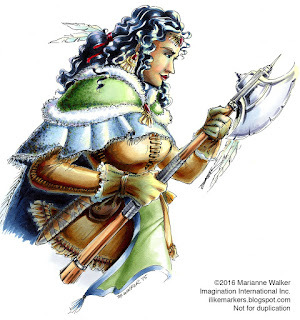 August 4-7 Gen-Con in Indianapolis, IN There will be ongoing classes in creature design, coloring, and map-making for gamers. Sept. 1-3 Salt Lake Comic Con, SLC, UT stop by our booth for tips on using your favorite art supplies. Wow! That's a lot of great events for people to attend this Summer! I hope to see you at one of these awesome places. 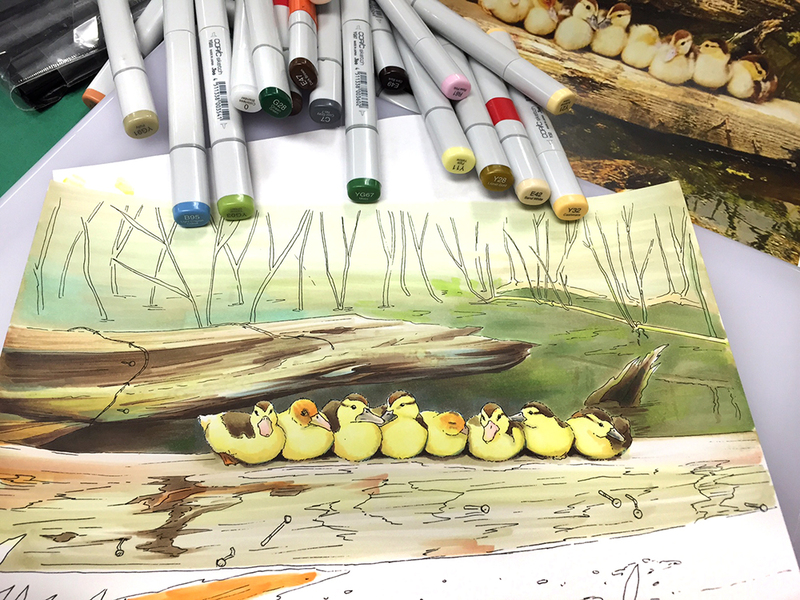 This Thursday afternoon, join me for an awesome live video where I'll show you coloring techniques, then we'll talk about how to "paint" with Copic inks. 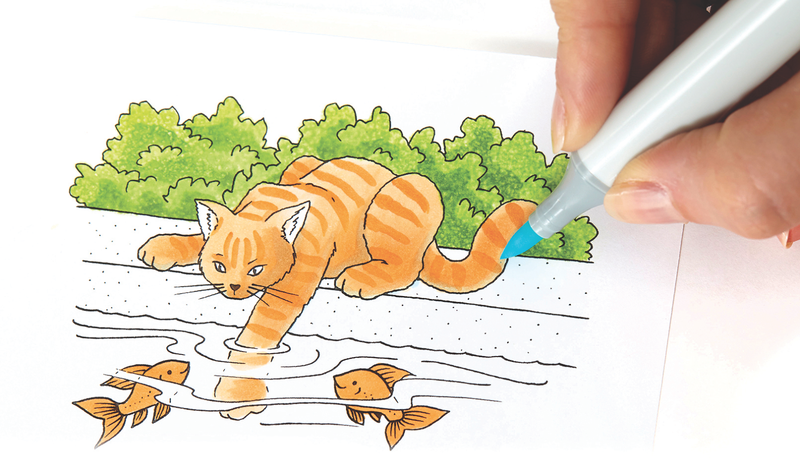 The theme is fish (because for some reason I wanted to color goldfish and koi). Koi (we will color this one with inks) If you want to follow along, print this onto a glossy paper or photo paper. Goldfish (I'll be showing some basic coloring techniques on this image) This image can be printed on your favorite marker paper (I'll be working on the Art Paper Pack, but you could print it on Blending Card as well). I hope to see you at the live feed! If you don't make the live feed, we will be posting a video after the event as well, so stay tuned. "How do you manage to get those 13yr old girls coming into my store, dragging their parents, to buy them art supplies?!?" He's not the first store to tell me that, and that makes me so happy! That 13 is a kid who sees value in creating, and has convinced their parent that making art is a core part of who they are. Making things defines us and gives us a deep satisfaction. How do you feel when you say the words "I made that!" I made that art, that cake, that flower arrangement, that goal, that dream, that life ambition...we celebrate and cheer, we pat each other on the back. And we learned long ago that once that was made, we move on to the next thing to make, always striving to make more. For some people, "I made that" is much harder. I made that bed, I made that step without the use of crutches, I made it out in public for the first time in months. Celebrate!!! You might feel that those are minor things, but not to the person in those shoes. You know what makes me sad? Giving up before trying. Deciding not to make anything because you feel that it isn't going to be amazing. Doing nothing because someone you've never met in person on the Internet can make it faster, better, prettier, or cooler than you ever could. Thinking that your best friend can make a better cake, so why should you bother, it won't be as good. I don't know the skill of the 13yr old girl the store owner mentioned. I know my skill as a 13yr old and I see 13yr olds in my classes all the time that are way more skilled than I was at that age. I do remember that at 13 I didn't really care what I couldn't do, I was focused on making what I could do, making what I wanted, pushing myself to make and make and make. I'd scrounge up my paper route money and bike down to the craft store for twine, beads, paints, cake stuff...whatever creative things I was experimenting with at the time. I didn't know my future self. I didn't know I'd be typing something like this in a hotel room thousands of miles from my hometown, helping teach art techniques to store owners...not because I'm the most amazing artist ever, (I'm not). I'm here because I was the 13 year old who also felt that constantly making stuff was the coolest thing I could be doing (besides reading books) and I never told myself that I wasn't any good. I guess my long winded conclusion is really this: Don't get hung up on Pinterest, Instagram, Facebook, or blogs, telling yourself you'll never be that good, so why bother trying? Everyone had to start somewhere. Be that awesome 13 year old in an art store! Celebrate everything you make! Make what YOU want, and be proud of every bit of it....then start again, and make more. That was so much fun! 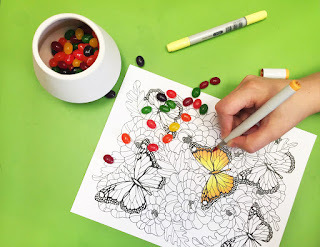 This morning, we colored some awesome butterflies on our live video feed on Periscope and Google. For those of you on YouTube, you can watch the video here. 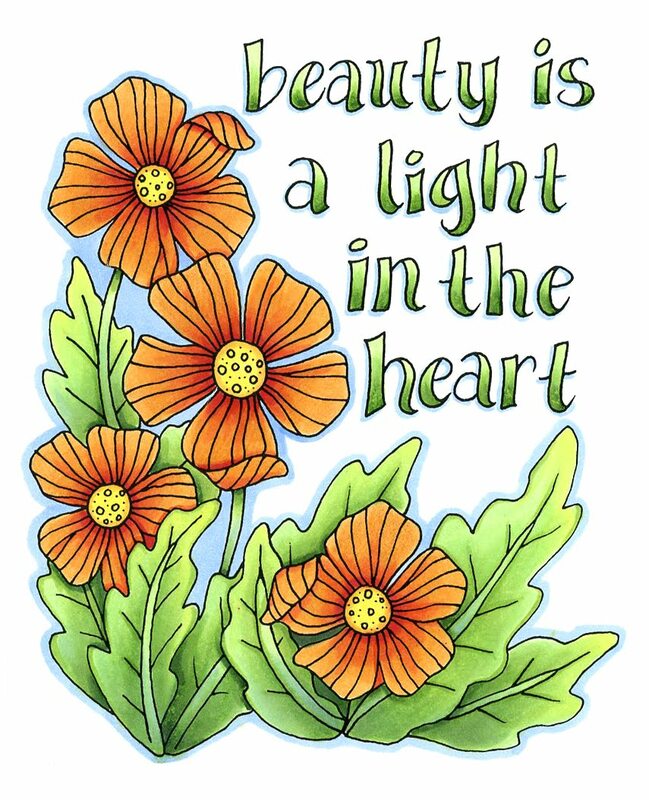 We colored the butterfly image from the Intro to Coloring with Copic Markers book, then we moved on to coloring a page from the additional Line Art Pack. You can download the individual sheet here for only $0.99! I really encourage you to watch the video, even if you don't have the book or line art yet. 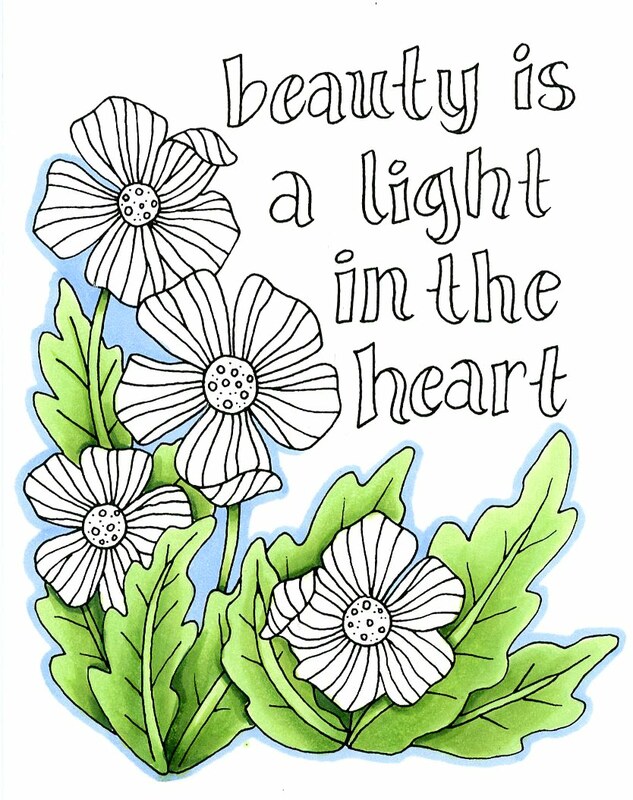 We had such a good turnout that we're going to try and host one of these live coloring sessions again in a few weeks. This will also give us a chance to work out some kinks and make it better. 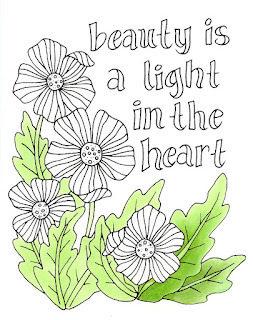 So, stay tuned for our next live coloring session. If you have a time of day that you prefer watching, please leave a comment and we'll try to see what we can do better next time. Have a colorful weekend! Check it out! This Friday I will be hosting a live video on either Google Hangouts (click the link to send yourself an invite and info). Or, via Periscope (Periscope is an app that allows you to watch live video feeds). 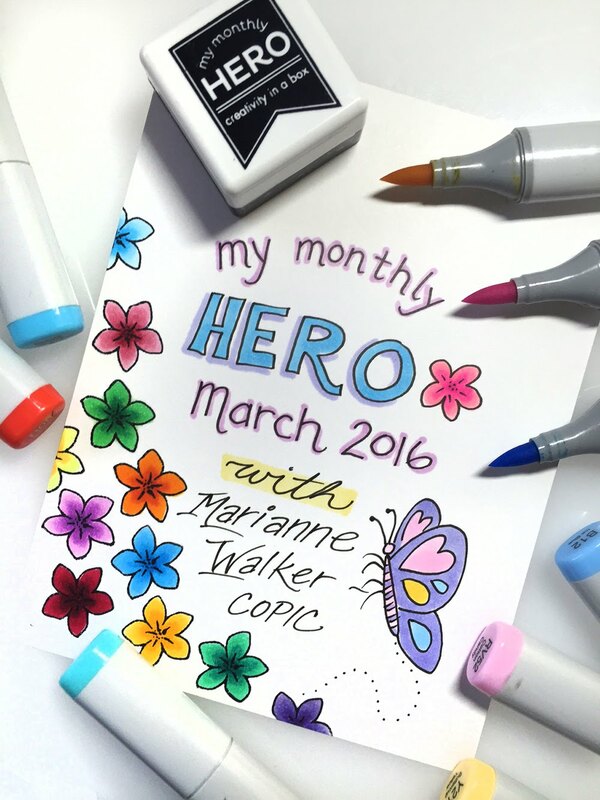 I'll be showing you some tidbits from the Intro To Coloring with Copic Markers book that I wrote. If you don't have a copy yet, I strongly suggest that you pick one up so you can follow along as I color. 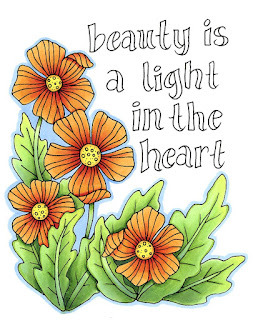 I will be starting with the first project in the book, the big, beautiful butterfly. From there, who knows what I'll color? 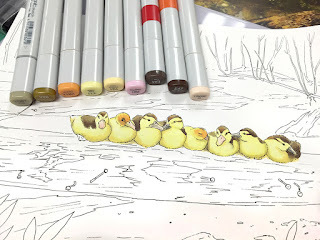 Whatever I color, it should be fun and hopefully you'll learn a few tricks and tips. So be sure to join us, 9am Pacific Standard Time. (Can't watch it live? Don't worry, it will be shared on YouTube). We will be trying to host regular videos, so stay tuned for more chances to watch and interact with us live. It's the next bet thing to having us come to your town, hover over your shoulder, and teach you how to color. 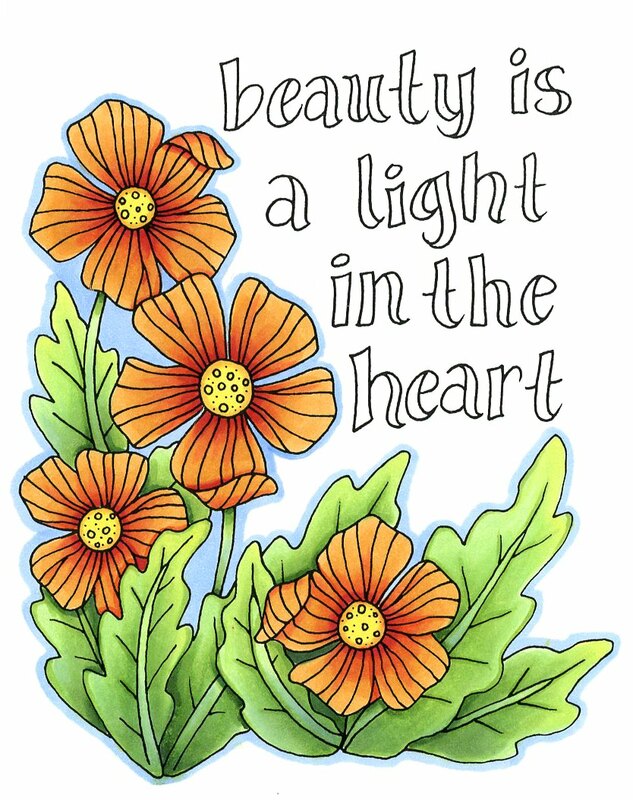 Wed. April 20, Afternoon, Heartfelt Hobby and Crafts, Sandy UT Marker coloring workshop. Contact the store for more information. 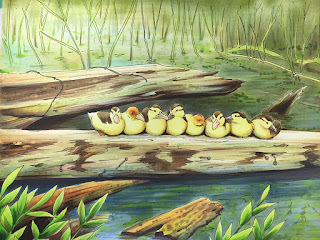 Wed. April 20, 6-8pm, Treasured Memories, West Valley City UT Alcohol Ink painting workshop. Contact the store for more information. 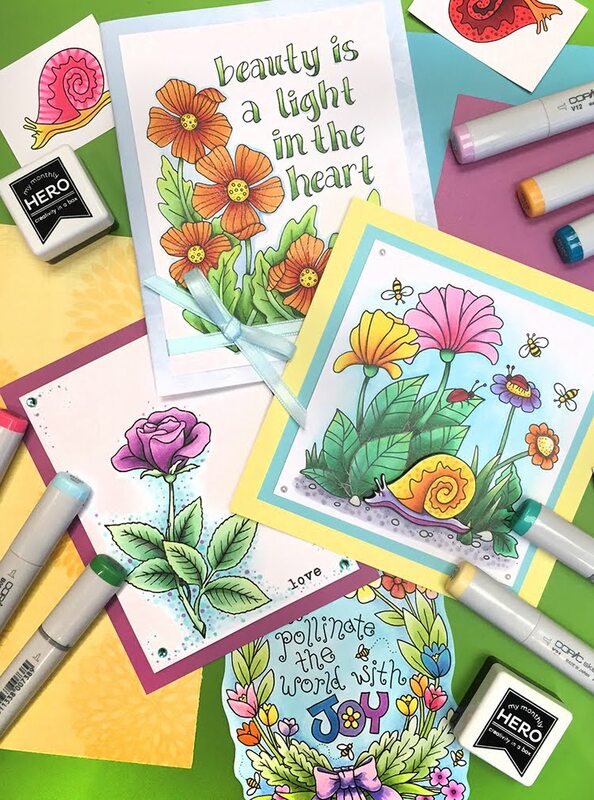 Fri. April 22, 10-12, Heartfelt Hobby and Crafts, Sandy UT Coloring Flowers with Copic Markers workshop as part of their Spring Escape & Create Retreat. Contact the store for more information. Sat. July 9th at Main Street Stamping in Tigard, OR. I know it's a long way off, but those classes are already nearly full, so contact the store to sign up soon! 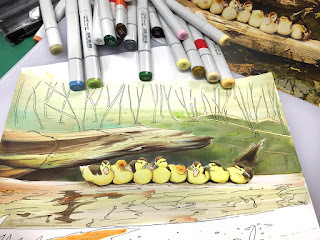 Copic will be offering some great workshops at Denver Comic Con, June 16-19th. Or, join me in LA at Anime Expo over the 4th of July weekend for awesome workshops. Sat. April 30th, 9am-3pm Girl's Rule event, Eugene OR. For girls age 9-14. I will be offering steampunk/fashion coloring workshops. Visit their website for more details. Then, this summer I will be offering classes at Eugene Library, Springfield Library, and Fern Ridge Library. Most of those classes will be in July, so check each website for exact dates and times. Meanwhile, here is a drawing I made a month ago while at a demo. 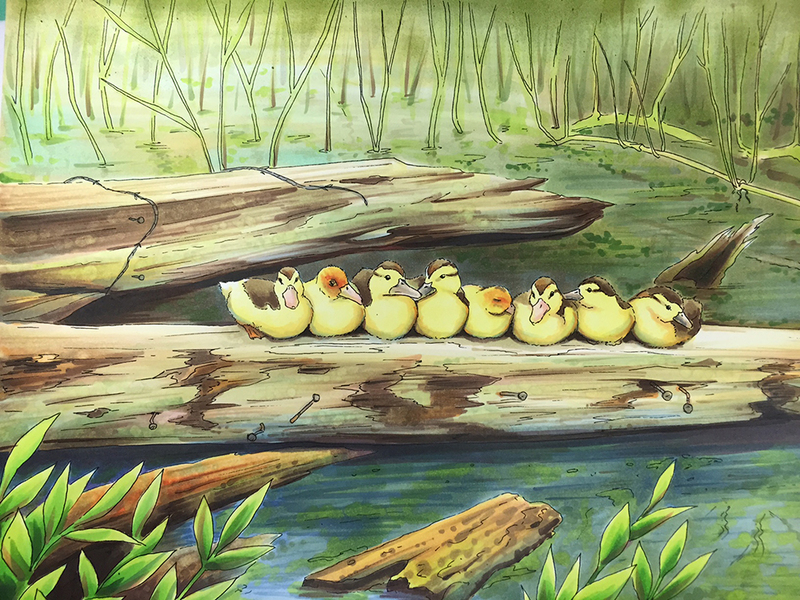 I didn't take step-by-step pictures of the process, and I don't remember what colors I used, but you can see that I used the airbrush to create the soft focus and lighting effects that you see in the background. I drew the outlines with a cool gray 0.1mm multiliner. From pencil to final coloring took about 5 hrs. This was based on a photo given to me by my dear friend Maaike in the Netherlands. Wow! I've been so busy working on all sorts of projects. My drawing fingers are sore, and my creativity is high. I just wanted to share some recent things I made, and give you a sneak peek at some upcoming cool stuff. 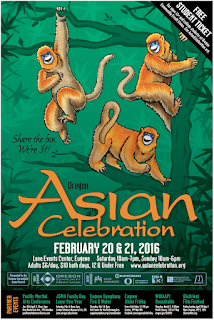 Each year I have the pleasure of drawing the poster for the Oregon Asian Celebration. 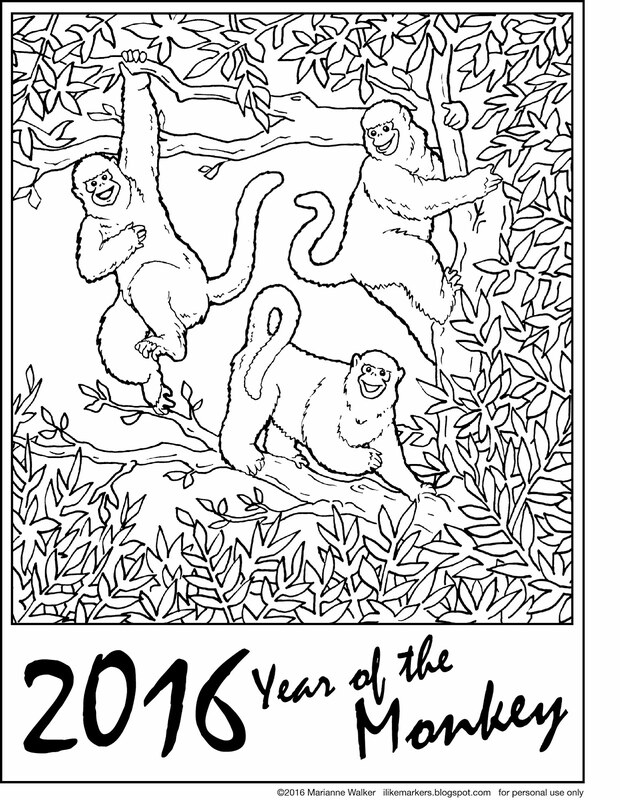 This is the year of the Monkey, and what better monkey to use than the beautiful Chinese Golden Snub-nosed monkey? I love their blue faces offset by rich golden fur. 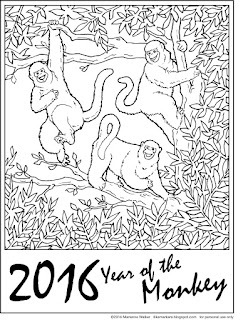 The poster is a playful combination of hand-drawn and Copic colored monkeys on a digital background. 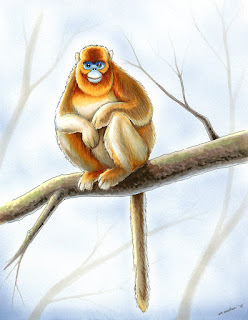 To get the committee excited about the idea, I found many reference photos online and composed my own drawing of one of these beautiful monkeys, cold and alone on a branch. I didn't write down all the colors I used, but I worked heavily with the E40's family, Y21, YR12, YR14, and YR27. The blue is combination of B29, B41, and B63. Then, I used some very light grays to suggest the branches in the distance, just like I did on this blog post of a bird, from a few months ago. My sketch paid off. 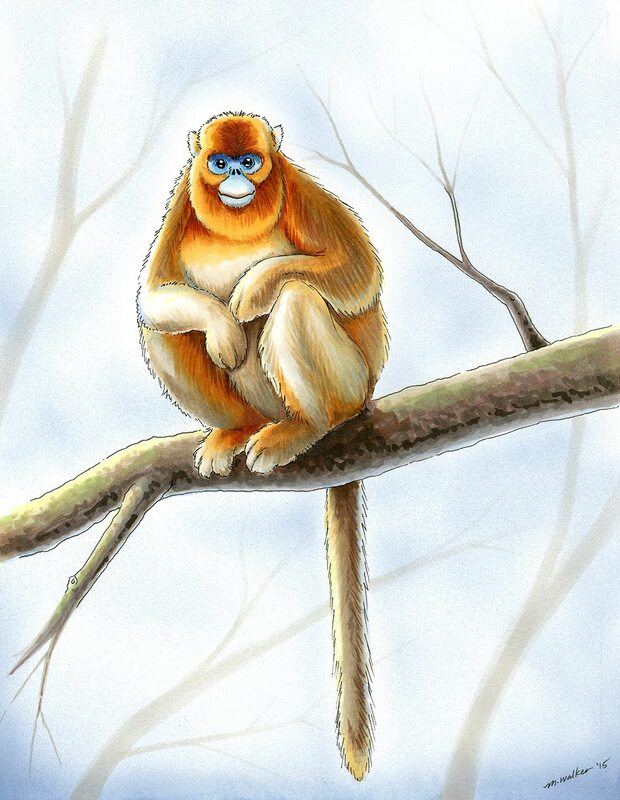 The committee agreed to let me draw these beautiful monkeys, they just wanted them to look a bit more lively than this poor soul, sitting alone on the cold, barren winter branch. 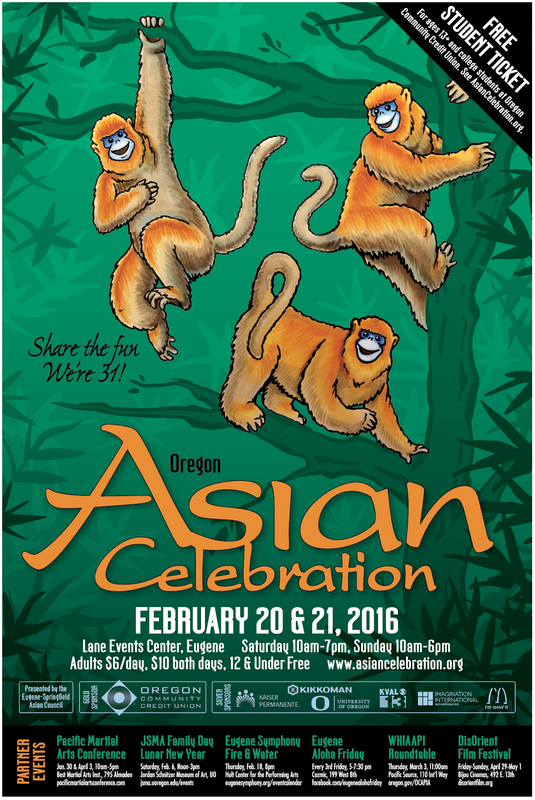 Oregon Asian Celebration. The convention is Feb. 20 & 21st, held in Eugene Oregon. 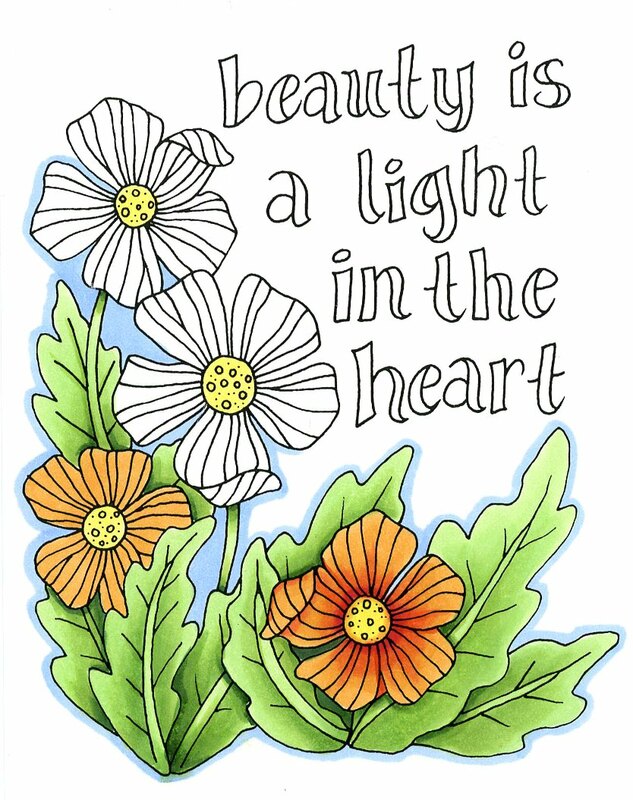 For those of you scattered around the world, here is a downloadable outline based on the poster that you can print and color. I have a few other great things coming up in the near future. 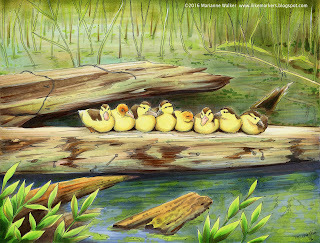 Feb. 25th 10-3pm I will be holding free demos at Proudly Oregon, at the U of O Bookstore on campus in Eugene. 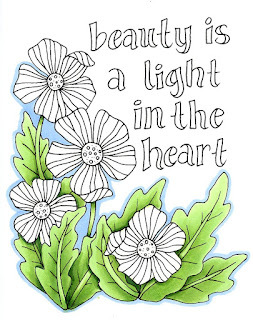 April 2nd I will host some beginner coloring classes at Main Street Stamping in Tigard, OR. You can contact the store for more info. show a neat project I'm working on with Hero Arts. Stay tuned!